if you’ve visited our union square location in the last month, you’ve had the pleasure of viewing artist and shala student adam dougherty’s intricate, exuberant, and reverent animal portraits. 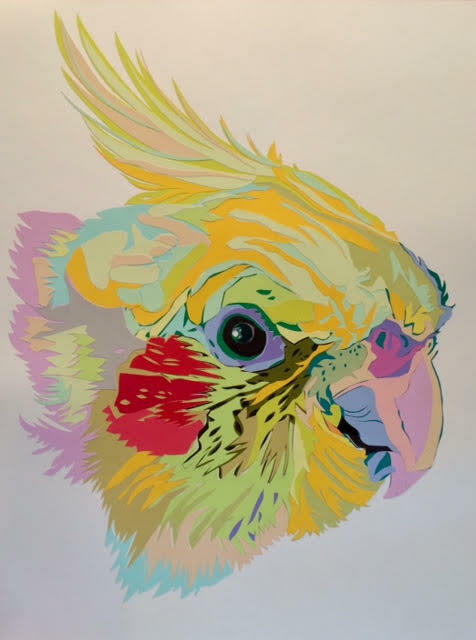 shortly after the show went up, fellow shala students jonathan and alene herman reached out to adam to commission a piece honoring their beloved cockatiel, rocky. jonathan shares rocky’s story here. shala teachers share their favorite books, documentaries, and talks on issues of race and ethnicity. vote for our next book club selection! follow this link to our book club poll. vote for the book you’d most like to see selected as the shala book club’s next read. a statement on our commitment to building a more diverse, inclusive, and equitable Shala community. We are in the process of developing a clear, comprehensive mission statement addressing our commitment to diversity and inclusion at the Shala. It is a work in progress, and we thank our diversity committee—Sasha, Shevy, and Megna—for their help. New Basics Class in Fort Greene with Deidra Demens. Saturdays 3:15 to 4:15. Starting March 9th. Also check out fresh wisdom: an interview with deidra. How would you describe Iyengar Yoga? When I started the Iyengar teacher training, I felt like I needed a foundation as a teacher. I had that as a student, because that’s what I was practicing. So many schools of yoga say different things about the different poses. I expected to go into the Iyengar teacher training and they would tell me, this is how you do it. We asked them, In Urdhva Hastasana, should the fingers be spread wide or should they be together? They said, Both. There are times when you spread the fingers wide, there are times when you bring them together. They told us that you are going to have to do both again and again and again and again until you understand what’s happening when you do it this way versus when you do it that way. When you teach class, you’re going to know when to tell the students to spread the fingers wide and when to tell them to bring them together. What I learned in the teacher training is that it was all about experience. That’s where the props come in. That’s where the different ways to do the poses come in. There’s no one way. When you practice asana, you’re finding yourself. You’re finding yourself in the classic shape, and then you change that up a little bit. It’s finding yourself in this pose but then there’s kind of looking back to, what does that tell you about who you are as a person, or where you are right now in your life, or where you want to be, what this whole thing is to you? It is structured. It can be strict. I can see how Iyengar Yoga is whole. I don’t know enough about other styles of yoga to see how their method is working to help people that are brand new or open-level or experienced practitioners or teachers or recovering from injury or pregnancy. I really appreciate how Iyengar Yoga strives to make yoga available to everyone. It’s so interesting how because of the structure, you can find yourself. I am interested in seeing people and finding how yoga can help them wherever they are. In Iyengar yoga, you are taught to see people.